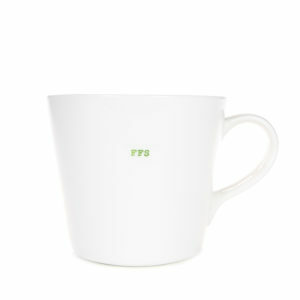 Choose a big mug from our selection of 500ml mugs below. Based on the bucket mug, the signature item in the Keith Brymer Jones Word Range, the 500ml version shares the same elegant proportions as the bucket mug, but in a bigger size. Ideal for the big brew drinker and fabulous for soups, the 500ml bucket mug is crafted from the finest quality super white porcelain and hand stamped with a phrase. The 500ml mugs from Keith Brymer Jones hold almost a pint (or exactly half a litre!) in style. These are massive mugs, with a whopping 500ml capacity. The extra-large mugs are perfect for big brew drinkers who like a lot of tea or coffee, and they are great for soups and messy desserts too. Based on the design of the Bucket Mug from Keith’s Word Range, the 500ml version of the bucket mug shares the same contemporary design, with a hint of retro style. 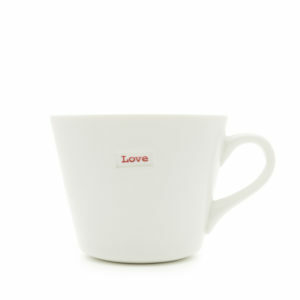 Crafted from the finest quality super white porcelain, the 500ml mugs ooze the same distinctive white elegance as the rest of the KBJ Word Range. 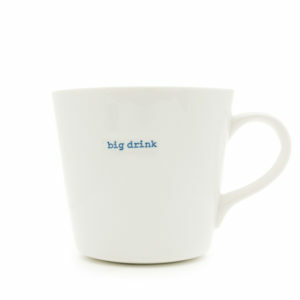 Large Bucket Mug 500Ml – Awesome!